Do not know what to wear?! Many people ask me this question over and over…What colours should I or should not wear?! Is what i am wearing ok? Should i not wear this? Just imagine how easy your mornings can be when you know what to wear and how to highlight your best features and make them work for you. If looking and feeling good is one of your New Years resolutions for 2016, then it is time to act! People make a lot of mistakes when it comes to style. You may think….Why does this even matter? During our style sessions we discuss each of the above. However – this information is useless if you fail to take action on it! Having helped many of our clients to improve their personal appearance – We know that those who actually do take action and make a commitment to change have the results they desire. Are you ready to start your style transformation? If the answer is yes, click here to book for a Style transformation experience now. Everyone is unique. Finding out what suits YOU is the first step to success. LOOK and FEEL good, achieve your dreams and accomplish your goals! All women know, it can be super frustrating having bra-blems. And I think all of us (women) can agree that these issues can make you want to rip off your bra the moment you walk in the door at the end of a long day! Sound familiar? Apparently 80% of women wear a wrong bra size according to Journal of Chiropractic and Osteopathy. I often get asked ‘How often should I get refit?’. The answer is once a year, because we are women, and our bodies change all of the time. Lots of things affect your bra size: pregnancy, weight gain and loss, holiday eating, stress, illness, medications, hormonal shifts, menopause… the list is long! So if you have not measured yourself this year it is a perfect time to do so. Don’t be surprised if your bra size is not what you thought, as I mentioned lots of women wear a wrong size bra. You may even be in between sizes and choose a ½ size cup for your closest fit. Wearing the right bra size does wonders for your figure, helps you feel more comfortable and confident and it’s best for your breast health and posture too! 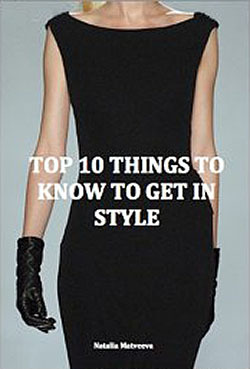 Please feel free to contact me at Natalia@Style-And-You.Com if you have any questions. We are always happy to hear from you!